The Owners - Enjoy & Have Fun !! 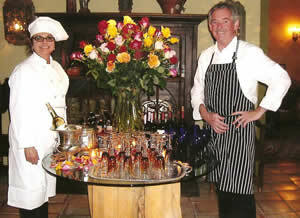 CiCi is a self-taught chef, cooking since the age of eight, though she later trained in the Southwest at the Santa Fe School of Cooking. As the owner of the Historic Pelham House CiCi wears many hats…Innkeeper, chef, certified massage therapist and clinical herbologist. Whatever she happens to be doing, whether it’s creating your special menu and preparing exquisite meals, rest assured that everything at the Historic Pelham House meets the highest standards due to CiCi’s passion and love. Robert has 40 years of experience as a special events planner and decorator. He has planted and painted and restored a historic home and created a beautiful sanctuary.